With the advancement in information technology computers have become a part of our everyday lives. We can hardly think our lives without them. So since they have become so important in our day to day lives we need to be familiar with at least some basic computer terms. 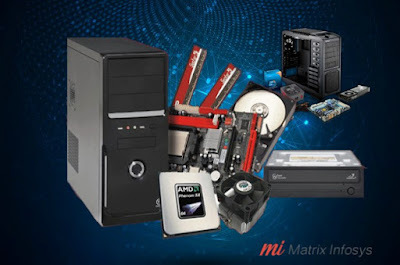 We at Matrix Infosys being one of the leading computer repair service providers in Kolkata through this blog have listed some basic technical terms you should be aware of. In Computers the term denotes a glitch or an error in a program. Browser is what we use for surfing the internet. These could be programs such as Chrome, Firefox and Internet Explorer , etc. You might often hear the statement ‘clear your cache’. This refers for removing the recently stored data. This gets stored in the RAM of the computer so that you can more access information quickly. But it might also cause to slow down your computer. Data retrieval is the process of recovering data which may be files, images, videos, music etc that you may not able to access either due to or damaged hard drive. A computer repair technician might often use the computer term defrag. This statement means employing a process to clean up a hard drive for removing files or parts of files and create empty space on your hard drive. This is a process is used as a last resort in computer repairs. If a machine can only be repaired by erasing data from the hard drive, then a full system re- installation would be required. The software has to be reloaded thereafter. This is a very basic computer terminology used. It refers to the physical components of your computer such as the mother board, fan, hard drive etc. IP is an acronym for ‘internet protocol’. It is made up of numbers separated by dots. Every internet connection has a specific IP address. This has become common now. It denotes a form of malicious software which is written to cause harm or damage to a computer or network. There are many different types of malware which includes viruses, Trojan horses, etc. The speed of the processor’s clock is measured in megahertz. A modem is also called as the router. This is the device that transmits data over the phone line. In the computer field the term partition refers to one or more sections of a hard disk. If you have a fault with the hard drive of your PC you might be lucky that it is just the one partition rather than both. Safe mode also known as safe boot are the technical terms used in computer repairs when a PC or Mac computer laptop or desktop cannot boot fully or is not fully operational. Spyware are programs written that once on your machine watch your keyboard strokes and other use of your computer. Thanks for the this wonderful post, You can visit ET Solutions LLC if you are looking for any kind of tech support regarding laptop. Thanks for the informative blog.If you want to buy gaming desktop canada you can buy them from versuspower.